What a week it’s been. In truth, there is much complaining I could do at the moment, but in an effort to be a bit more optimistic, I’m taking a look at the things that have brought a smile this week. As of tomorrow at 4:00, it’s the last week before spring break! I have (count ’em) FIVE days of school until we get a week off, and my only plans consist of playing with Jude, unwinding from an insane semester, and getting a much-needed pedicure and haircut. Spring break approaching means it’s soon to be the end of the school year. This means I have (count ’em) THIRTY-FIVE school days until I am a full-time mama. Words cannot express how excited I am or how blessed I feel about this opportunity to give more of myself to little Jude. Wednesday brought a less-than-fun massive faculty meeting about the cuts in funding and “reductions in force” that are part of the plan for my school district and many others in the coming months. That state of public education in this state is quite dismal, folks. Politics of public education can drive a sane man crazy, and I left that meeting feeling so discouraged. 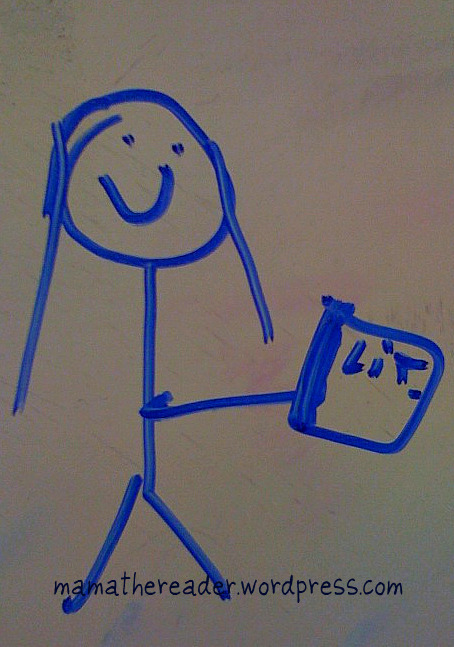 I did, however, find this little gem lovingly sketched on my dry-erase board the same afternoon. It was Free Pastry Day at Starbucks on Tuesday. Woot woot! Somehow the Cinnamon Chip Scone tastes even better when you didn’t pay for it. Jude is finally rolling over! I mean if you had to lug that massive head and big belly around all day, you’d find it difficult too. He’s been reaching and even sitting up unassisted for some time now, and my pediatrician assures me he’s just fine, but at almost 6 months, I was growing tired of the “is he rolling all over the place?’ questions and subsequent feelings of oh-my-god-i-think-my-baby-is-broken. I received my FREE Bumgenius AIO this week in the mail! I am a cloth diaper addict, and AIOs are pricey. Free diaper in the mail = exciting. Hang on for this one, there’s a spark of gratitude eventually. I received the horrible news about the passing of a college friend’s husband this week. I grieve for her so much, and there really are no words to describe what it feels like to think of someone who is so kind and giving living a nightmare like this. While her situation is tragic, it’s times like these that I’m grateful for my experience at a small college where classmates and community become family. Seeing the outpouring of love for Melissa from her former classmates, professors, university officials, and other alums makes me so grateful that I have this second family. That said, the shock and grief right now is unimaginable. She is in my every thought; please pray for her healing in this difficult time. This is a reminder to love hard and live out loud. Nothing is guaranteed. I passed a church sign on the way to work this week that says, “You don’t have a soul. You are a Soul. You have a body.” (C.S. Lewis) Sometimes it’s the little things that can be a BIG reminder that you need. Lastly, Atlanta has had some beautiful spring weather this week, and trees are in bloom. Sunny barefoot porch times are on their way! I love what you wrote about the Brenau family, and I have noticed the same thing. Even staff members here have asked me how *I* was doing because they knew we were such good friends. As annoying as any job can be at times, I know where I am is a great place and, like you said, a second family. I just cannot imagine…. BUT, I am so thankful for my college buddies like you! We don’t all say this enough, but I am so glad to call you a friend and sister. PS…Still so totally jealous about all the time you will get to spend with Jude after school gets out. You will love it! You are right! We are lucky, lucky girls. You feel such a kinship with other Brenau girls that you have a strong connection with them, no matter who they are. It’s like when you meet an older alum and feel like you already have something in common. I love it!